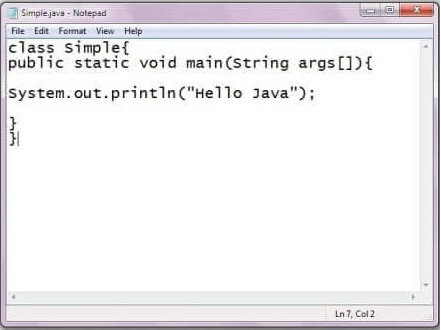 To create a simple java program, you need to create a class that contains the main method. Let's understand the requirement first. 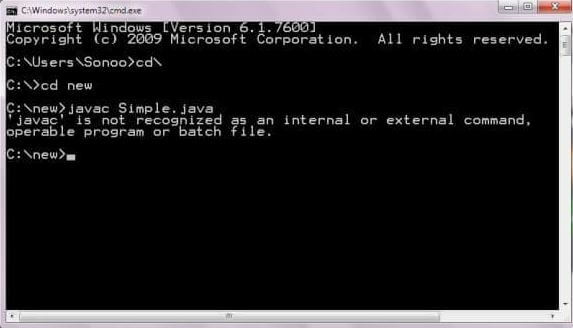 When we compile Java program using javac tool, java compiler converts the source code into byte code. public keyword is an access modifier which represents visibility. It means it is visible to all. static is a keyword. If we declare any method as static, it is known as the static method. The core advantage of the static method is that there is no need to create an object to invoke the static method. The main method is executed by the JVM, so it doesn't require to create an object to invoke the main method. So it saves memory. void is the return type of the method. It means it doesn't return any value. System.out.println() is used to print statement. Here, System is a class, out is the object of PrintStream class, println() is the method of PrintStream class. We will learn about the internal working of System.out.println statement later. 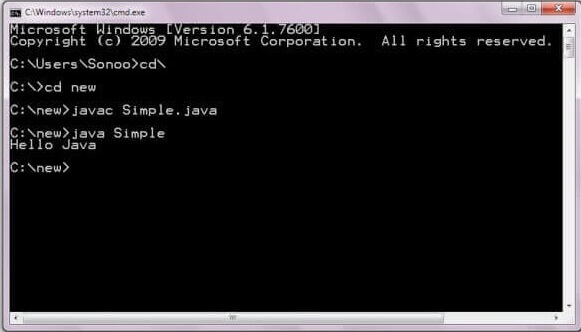 As displayed in the above diagram, write the simple program of java in notepad and saved it as Simple.java. To compile and run this program, you need to open the command prompt by start menu -> All Programs -> Accessories -> command prompt. 1) By changing the sequence of the modifiers, method prototype is not changed in Java. Let's see the simple code of the main method. 2) The subscript notation in Java array can be used after type, before the variable or after the variable. Let's see the different codes to write the main method. Let's see the simple code of using var-args in the main method. We will learn about var-args later in Java New Features chapter. 4) Having a semicolon at the end of class is optional in Java. Let's see the simple code. Resolving an error "javac is not recognized as an internal or external command"? If there occurs a problem like displayed in the below figure, you need to set path. Since DOS doesn't know javac or java, we need to set path. The path is not required in such a case if you save your program inside the JDK/bin directory. However, it is an excellent approach to set the path. Click here for How to set path in java.